We now have the ability to create awesome websites for an entire real estate brokerage! This is a huge new addition to the RealtyNinja family and we’re excited to launch it today. If it’s time for your office to get a new and improved website, get your managing broker to contact us right away to get started! All of the agents in the office are displayed in a nice format with their photo, contact info and a link to all their active listings. The user can also search for an agent by name or language(s) spoken. All of the agents active listings are shown and kept up to date automatically. 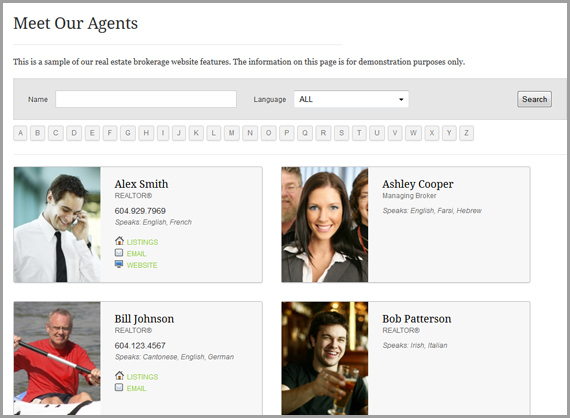 The broker owner can easily manage the agents on the website with minimal effort. All blogs now have an automatically generated and updated RSS feed. Made it so that if you are on a sub-page and you open the top-level menu item dropdown, the page you are on is marked. Implemented proper response status codes when accessing a listing or building that used to exist but was deleted. This helps SEO (in Google Webmaster Tools). Stay tuned for more great new features and enhancements from your friends at RealtyNinja.